SAULT STE. MARIE -- The McGuinty government is reducing waiting lists for the Partner Assault Response program and ensuring that roughly 400 additional domestic violence offenders receive group counselling this year. Provides victims with information about offenders, including whether there may be a continuing safety risk. Across the province, the government is investing more than $550,000 in one-time funding for Partner Assault Response programs this year. This funding is in addition to the program's $8.6 million annual budget. Attorney General Chris Bentley, accompanied by Sault Ste. Marie MPP David Orazietti, announced the additional funding at Algoma Family Services in Sault Ste. Marie. "The McGuinty government is deeply committed to making the justice system more responsive to the needs of victims of crime," said Bentley. "We are pleased to work with excellent community agencies, such as Algoma Family Services, to help make sure that people who have abused their partners are held accountable and that women and children can live free of fear and violence in their homes." "The Partner Assault Response program makes our communities stronger and safer by helping to prevent violence against women," said Orazietti. Algoma Family Services is receiving additional one-time funding of $17,115 this year, for a total of $150,865. "This additional funding will help us meet increasing service demands this year and ensure our clients get the help they need, when they need it," said executive director Lynn Ryan MacKenzie. 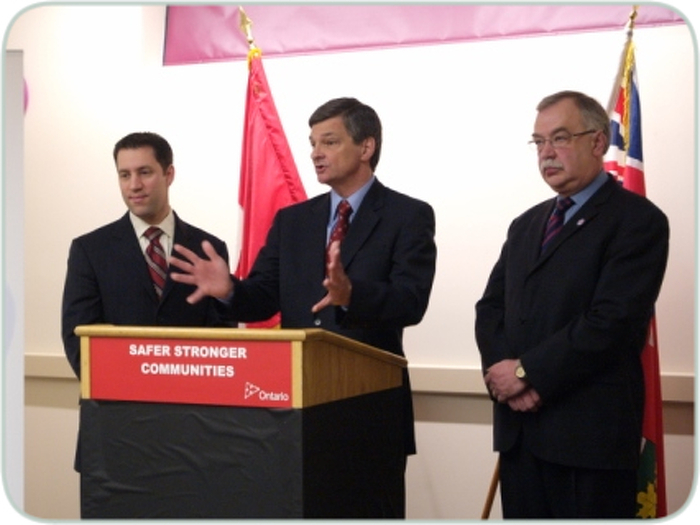 The Partner Assault Response program is an integral part of the McGuinty government's response to domestic violence. The government is committed to making the justice system more accessible and responsive to the needs of victims of crime. This document was published on January 23, 2008 and is provided for archival and research purposes. Attorney General Chris Bentley announces increased funding for Partner Assault Response program at Algoma Family Services in Sault Ste. Marie today, flanked by David Orazietti, MPP, Sault Ste. Marie (left) and Mike Brown, MPP, Algoma-Manitoulin. Attorney General Chris Bentley invites victim services and justice partners to the podium at a funding announcement in Sault Ste. Marie today.